1 Pack of 25 New BCW Older, Large Size Dollar Bill Toploads. These can also be used for larger tickets. 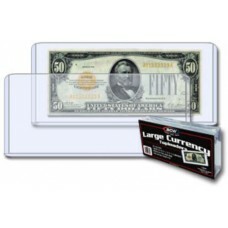 Do you have any questions about Pack of 25 BCW Large US Currency Hard Plastic Topload Holders?